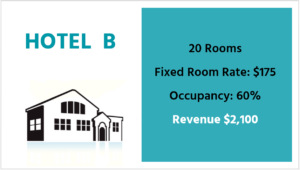 Occupancy vs. Revenue – What is the best measurement of success? Ask any experienced revenue manager and they will advise that it’s vital to focus on revenue results, not just occupancy. Why? Regardless of whether you have a peak or quiet season, it’s important to be thinking as your year as a whole and plan ahead. Rather than striving to reach 100% occupancy, we encourage you to use your revenue results to measure the true success of your strategy. Previously, many operators have used occupancy figures as their measurement of success. Having your ‘NO VACANCY’ sign up is not always worth celebrating and as a savvy operator will know, using the revenue results will give a true reflection of how well the business is actually performing. If your strategy during quiet months has typically been to discount rates to get occupancy, the team at Rooms Online urges you to consider if this is a sustainable and innovative way to do business. 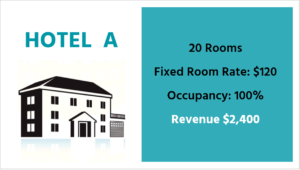 Hotel A was very occupancy focused and dropped room rates in order to get occupancy. Revenue results show that Hotel A sells inventory too easily at a lower rate than what could otherwise be achieved. Hotel B was too rate focused and not in tune with demand. The rate is too high for the market booking lead time and the property has priced themselves out of the market. The revenue and occupancy results have both suffered as a result. 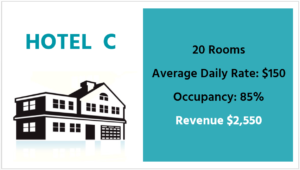 Hotel C used dynamic pricing. 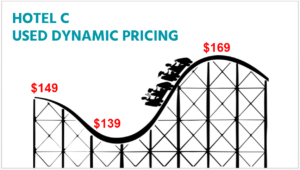 By monitoring demand and reacting accordingly, they changed their price points several times for the same stay date to ensure they were never too cheap nor too expensive at any given time. This property achieved the highest revenue result based on market demand. This shows the most effective yield management. Rather than pricing at lower rates to ensure they sold all of their rooms, they incrementally increased rates as their demand picked up. By shifting the measurement of success from occupancy and instead focusing on forward-planning and getting more revenue, this property not only increased the average daily rate (ADR), but has actually sold fewer rooms and therefore lowered costs. The Hotel C scenario is where Rooms Online aims to get all of our clients. We do this by frequently checking availability and pick up, and then fluctuating rates to get the best chance of the perfect balance between occupancy and rate. We also manage promotions with your online channels in order to encourage advance base business during your need periods. Promotions are used if and when you need them only, which allows for a more targeted approach.